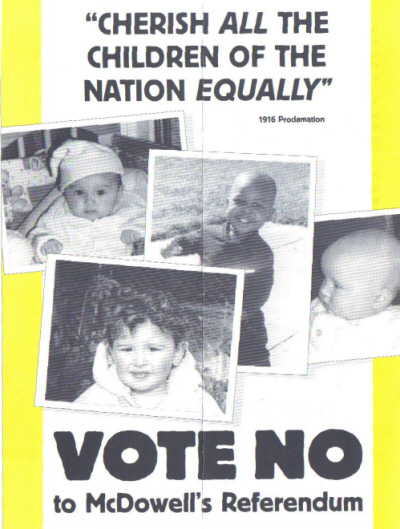 From the Campaign Against the Racist Referendum a Leaflet in Arabic urging a No vote in the Citizenship Referendum of 2004. The Referendum was passed. My Arabic isn’t great so I’m not too sure what the leaflet says..
From the Citizenship Referendum in 2004, the booklet produced by The Referendum Commisson. It would have been delivered to most if not all houses in the country. Up until 2004 if your child was born in Ireland, you were entitled to citizenship. It was felt that this left the country open to people coming into the country to give birth so they could automatically gain citizenship. It was passed by 79% Yes to 21% No. Michael McDowell was Minister for Justice at the time. 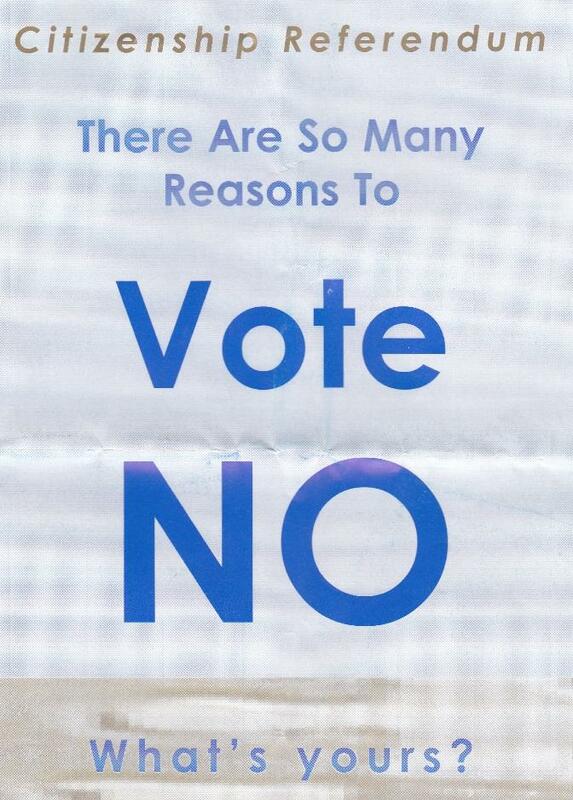 From the 2004 Citizenship Referendum a leaflet from The National Women’s Council of Ireland calling for a No vote. 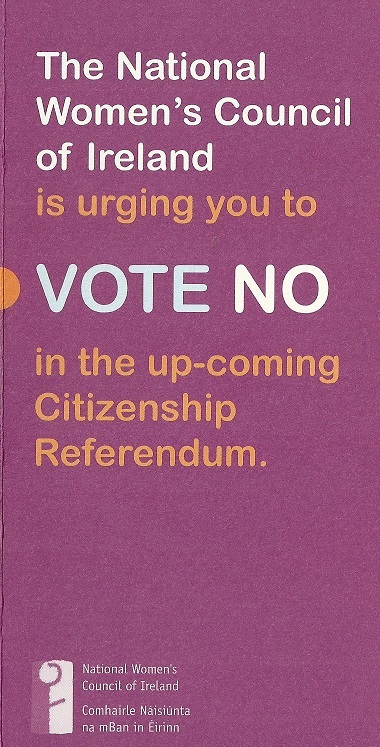 From the 2004 Citizenship Referendum a leaflet from the Irish Council for Civil Liberties urging a No vote. Issue 2 from 2004 of the Ogra Fianna Fail newsletter Grassroots. Amongst other things are an articles on the upcoming Citizenship Referendum, a young candidates guide to the Local Elections, an interview with Michael Martin and much much more. Ive uploaded it HERE. Clicking on the cover image will also launch it. 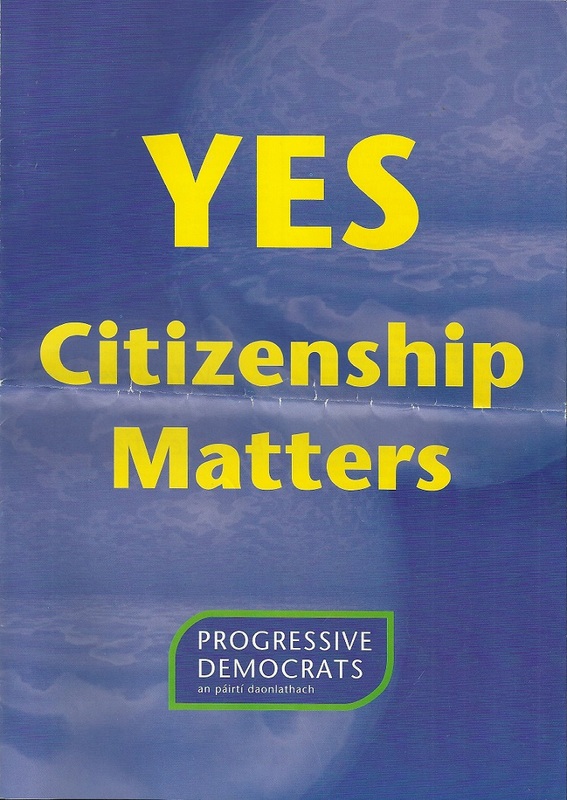 From the 2004 Citizenship Referendum a Poster issued by a group called ‘Just Citizenship’ along with Colm Mac Eochaidh and Green Party TD Ciaran Cuffe. 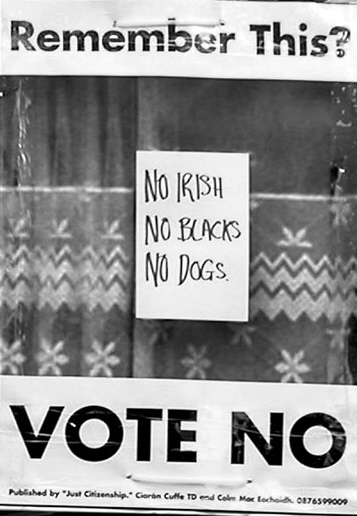 The striking image of the window with “No Irish, No Blacks, No Dogs” reflecting the experiences of many Irish Emigrants over the years. 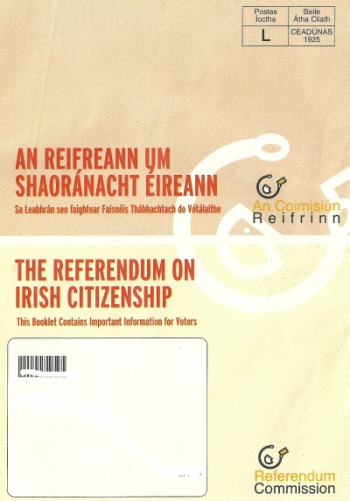 Other material From the citizenship Referendum. 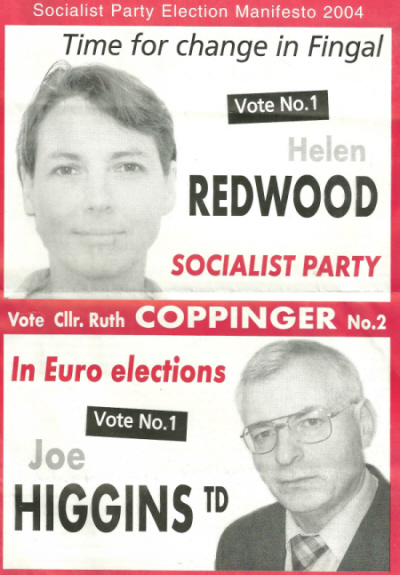 From the 2004 Local Elections, Socialist Party candidate Helen Redwood running in the Mulhuddart LEA. Voters are asked to give a number 2 to her running mate Ruth Coppinger. Helen Redwood polled 607 votes and failed to get in, however her colleague Ruth Coppinger was easily elected. The party outlines both their national issues as well as issues local to Fingal and Blanchardstown. 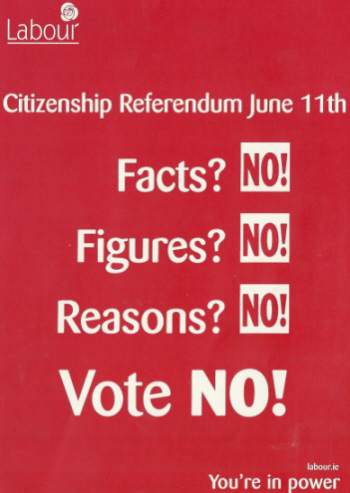 Also here are The Socialist Party urging a No vote in The Citizenship Referendum and Joe Higgins looking for a vote in the European Elections. This is the Index of Fianna Fail material posted to date. “One Nation” -1959 Fianna Fail Pamphlet of a Speech by Sean Lemass to the Oxford Union Society. From 1932 a Fianna Fail ad promoting protectionism. Albert Reynolds Message To Delegates From The 1993 Fianna Fail Ard Fheis Clár. Charlie Haughey’s message to delegates from the 1980 Fianna Fail Ard Fheis. From 1980 details of the number of Fianna Fail Cumainn nationally and report of the National Executive. Fianna Fail Ard Fheis Clar 2012 and some highlights from it…… including some motions. The Programme For The 2007 Ogra Fianna Fail National Youth Conference. Leaflet From Fianna Fail Dundrum Local Area Rep Sarah Ryan. ‘Not Just At Election Time’ 2007 Bertie Ahern Flyer giving details of clinic times and more…. Thought these results may be of interest, having found them on a backup of an old PC. “Who Will Defend You?” leaflet from Pat Rabbitte, Eamonn Maloney-Labour Party -2011 General Election Dublin South West. From 1979 leaflet from Ballymun Branch of The Labour Party to Labour Councillors and Tenants of Ballymun. Nice of the Indo to give a bit of credit on Callely Leaflet! One Per Cent Network Poster/Leaflet advertising a political walking tour through D2 and D4 on Saturday 9th October. A series of Posters protesting at the Popes visit to the UK.